CASA (Care And Share Associates) provide high quality health and social care for those in need across the UK. 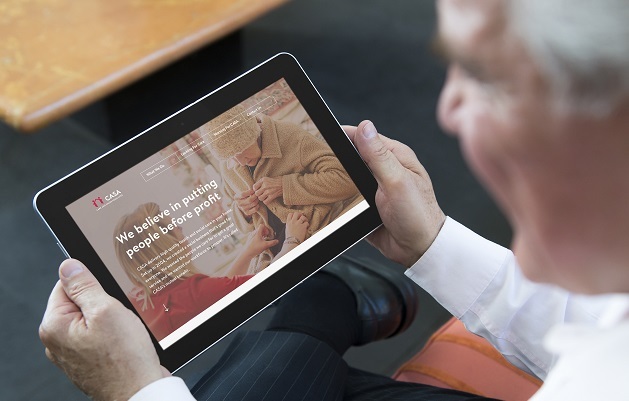 With plans for growth and recruitment this year and beyond, they were in need of a new, easily accessible website which would cater for a wide range of potential users. It needed to also effectively sell CASA as a company to help recruit new members of staff in the 8 different UK cities they’re based in. In the early stages of the project we discussed at length the specific requirements the new responsive site would have. We considered the levels of ability that various users might have when accessing the site. Although some users may be the relatives of those requiring care, a great many of the users will be looking for care themselves. We therefore needed to make sure they had a clear and simple journey from A to B, so user experience across all devices was an important consideration. The old site was very complicated and text heavy, with small imagery, and was not responsive. For the new site we used a mix of hover effects, bright colours and neutral warm tones. We complemented this with large imagery and font, and clear calls to action to improve UX. We also discussed the need to commission some new photography. This was to ensure the ethos of the company was easily and cleared communicated. New imagery is especially important with these photos being used at maximum size throughout the site. The imagery needed a very warm tone, with a focus on expression and the CASA staff doing their jobs. We were keen to show them caring for real people, rather than shots which are obviously staged. We worked with the photographer and the CASA team to make sure that the right imagery was obtained and would be then used appropriately throughout the site. We’ve enjoyed working with CASA, finding out more about their mutually beneficial business model and seeing how they help people. We hope that we have helped them convey their USP effectively to prospective clients and job applicants. We look forward to working with CASA again in the future. For more details please see the full CASA site here. If this sounds like something we could help you with, then why not give us a call. We’ll arrange a time for you to drop in for a chat over a coffee.